Smoked Hickorywood Salt - Chef's Jar | SF Salt Co.
We created our Hickory Smoked Sea Salt in honor of BBQ lovers. Perfect for BBQing and grilling, our Hickory Smoked Sea Salt is a staple in the seasoned grill master’s pantry! Smoked Hickory Sea Salt is made with pure, crisp Pacific Ocean Sea Salt that has been slowly smoked above an all-natural Hickorywood fire. 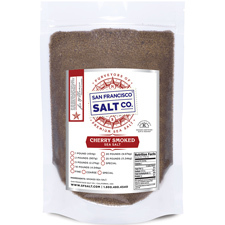 Enjoy rich, aromatic hickory flavor with this essential smoked salt. 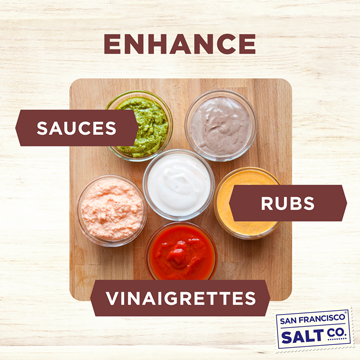 CREATE THE ULTIMATE SALT RUB - Massaging Smoked Hickory Sea Salt into meat before cooking helps to insure that meat retains moisture while cooking, while also adding rich smoky flavor! 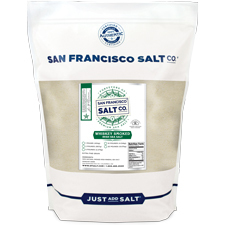 This salt is flavorful enough to stand alone but also mixes easily with other spices to create custom blends. 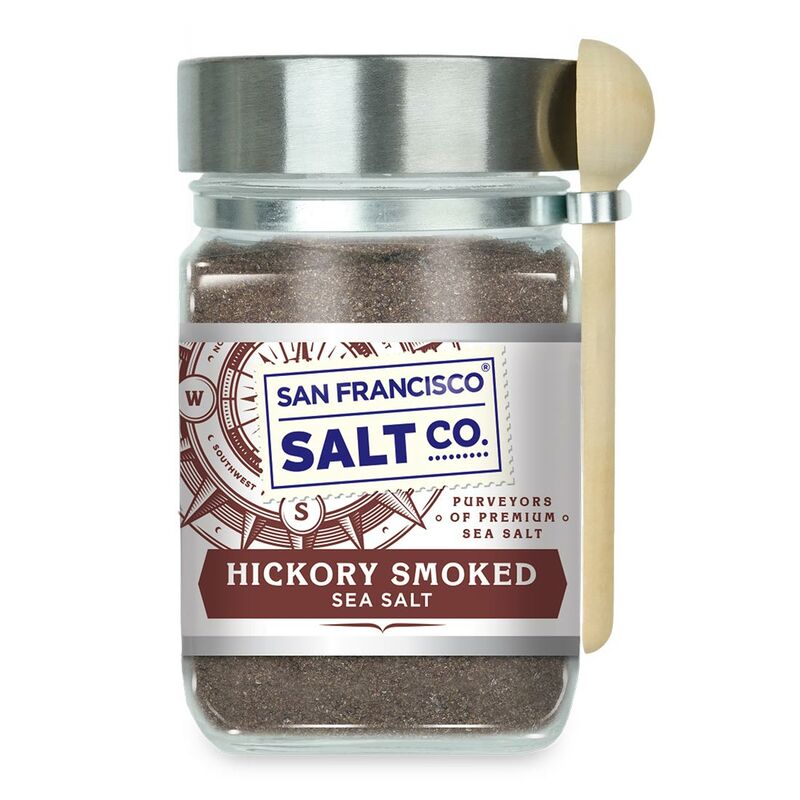 SEASON TO PERFECTION - Hickory Smoked Salt adds an authentic deep smoky flavor to Red Meat, Chicken, Soups, Sauces, and more. The complexity of this salt adds richness to alcohol when used on the rim of your favorite ale or cocktail! ESSENTIAL FOR BBQ ENTHUSIASTS - Hickory is the most popular wood used in smoking because of its instantly recognizable iconic taste! This salt is a pantry necessity whether you are a seasoned grill master or a BBQ novice! DESCRIPTION�- Smoked Hickorywood Sea Salt is made with pure Pacific Ocean Sea Salt that has been slowly smoked above a�Hickorywood fire. Packaged in our U.S.A., SQF Quality code compliant facility. PACKAGING�- 8 oz. Chef's Jar with a wooden spoon. 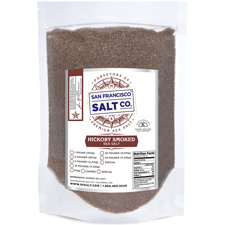 PROPERTIES�- Our Smoked Hickory Sea Salt is non-GMO, certified kosher, and does not contain any MSG, soy, gluten, dairy, or anti-caking agents. Crafted in the USA. 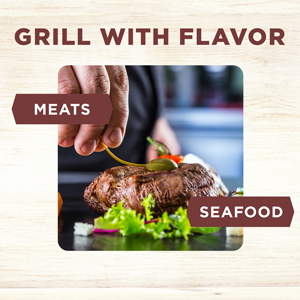 Use Hickory Smoked Sea Salt in rubs or as a finishing salt to add fresh off the grill flavor to meat and seafood. 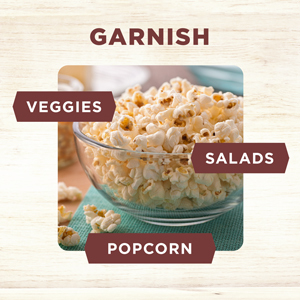 Enjoy the aromatic flavor of Smoked Hickory Salt on grilled veggies, salads, and popcorn for a smoky twist. 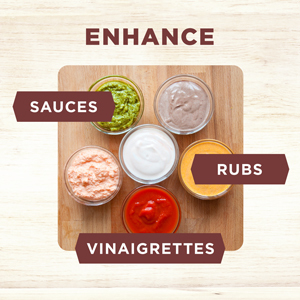 Create your very own homemade BBQ Sauces and Salad Dressings, or enhance the flavor of store bought sauces with a sprinkle of Hickory Salt.